When I heard that the GRAMMY-winning Kronos quartet was coming to play at my small liberal arts college, Wesleyan University, I knew that I had to try to talk to their bandleader David Harrington. This wasn’t just because of the famed string quartet’s legendary status and instrumental virtuosity. No, it was more than that. For over forty years, the Kronos Quartet has been exploring the music of different composers, genres, and cultures. They actively engage in a dialogue with other musicians, whose past music they present with new and radically different instrumentation. This type of artistic interaction and boundary-pushing reminded me of why I originally founded Reverberations as a platform for young people to engage with art in the first place. Speaking on the phone with Harrington as he drove to the studio to record a new album, I learned that it all started with a song that he’d listened to for the first time back in 1973. Sage Marshall: What inspired you to start the Kronos Quartet back in 1973? David Harrington: In August of 1973, I heard a recording of Black Angels (1971), by the American composer George Crumb, on the radio. I’d grown up playing quartet music, starting with Beethoven, then Mozart and Schubert. Eventually, when I was about sixteen, I started playing music that was newly written. During my high school years and afterward, the American war in Vietnam was going on, and it was a very disorienting time to be young and a musician. I was questioning the value of music. Then, all of a sudden, hearing Black Angels brought together the world of Jimi Hendrix and distortion and a wide variety of sound. It seemed like an answer to me. I realized I had to play that piece. So, I called up the publisher and got a score to Black Angels. I’d never seen printed music that looked like that. It didn’t look like normal music. Not only did it not sound like anything I’d ever heard, but it didn’t look like anything I’d ever seen. So, anyway, that’s when I started Kronos. SM: That’s awesome. One of Reverberation’s big mission statements is to look at the way that art can reverberate beyond itself and inspire different artists, so your story is actually right in line with our magazine! I’m really intrigued by the interactive aspect of playing in a string quartet. I’ve read you describing it as similar to having a dinner conversation. How does this interaction work? Why do you all find it so productive? DH: Being in Kronos, we need everybody’s best energy, best thinking, and best ideas all the time because we’re hand-making musical experiences. Basically, we’re helping to teach each other how to improve our work. Right now, for example, I’m headed to a recording session. I’m sure there will be things people say to me today that will help me do my part better. If you can imagine a little society made up of four people that is truly functional, where every person is absolutely critical to the overall result, that’s what Kronos is like. SM: You often play music that, in some form or another, has been played by different musicians previously. How do you balance putting your own interpretation on these pieces, whether they be John Coltrane’s jazz songs or Rhiannon Giddens’ folk songs, with the originals themselves? DH: In the case of “Alabama” by John Coltrane, his recording of the song basically becomes the score. When we’re playing John Coltrane, I want every member of Kronos to try to sound like him, in the same way as when we’re playing music by N. Rajam. We’re all expanding the frame of reference we have as musicians and listeners. When we pay tribute to another musician or form of music that we haven’t played before, it’s a chance for us to expand our abilities and sonic palette. That’s what musicians do. We hear things we like, and we try to bring them into the world that we know. SM: I’m wondering what particularly drew you to “Alabama”? DH: I can’t believe that I did not know about that piece until about six months ago. Kronos had been invited to play a program of music from the 1960s at Carnegie Hall. I happened to be reading Song Lines Magazine. This was after #45, as I’m going to call him, issued one of his travel bans. The editor, Jo Frost, was talking about the way musicians have dealt with major social issues throughout history. One of the pieces she mentioned was Coltrane’s “Alabama” and how it was inspired by the death of four little girls at a church in Birmingham. I realized, I’d never heard the piece. Instantly, I searched for it on YouTube. Ten minutes later, I called Jacob Garchik (the person who arranged the song for Kronos) and said we’ve got to play this piece for the sixties concert. Unfortunately, we didn’t have enough time to learn it for that concert. So, our premiere of the song is going to be at Wesleyan University. SM: That’s really exciting for all of us here at Wesleyan. So, you talked a bit about playing music from all different parts of the world. I find it really impressive that you can take on different sounds that aren’t derived from “western music.” Why is exploring world music important to you personally? DH: At a certain point, I think I was fourteen, I was looking at the globe we had at our house, and I just had one of those moments you have every once in a while in life. I noticed Vienna, Austria, and I had this realization that all of the string quartet music I’d ever played was written by four guys that lived in that same city in the late 18th and early 19th centuries. That seemed pretty weird. I realized that what I was going to do was to explore music from other cities, other countries, other religions, and other languages. SM: Since you’re coming to play at a college that has many aspiring artists of its own, do you have any advice for up-and-coming musicians who are inspired by the music you create? DH: One of the wonderful things about music is that there are many ways into it. You know, it’s like this vast realm of possibilities. There’s no real “right way” or “wrong way”; there are just many, many ways. Each person’s inner sound world belongs totally to them. It’s this very beautiful, private thing that each of us has—our own private world of music. When you have a musical experience that kind of changes your molecular structure, which I believe happens, you add new possibilities, musical colors, and rhythms to your inner world of wonder. I just believe in the value of that so much. There are a lot of very tough things in life that have to be surmounted. One thing that’s true for sure is that music itself will never ever let you down. What's David Listening To? A Listening Session with David Harrington will take place at 10:30 a.m. on Sunday, April 15th at World Music Hall (located at Wesleyan University's Center for the Arts.) Tickets are $20 for the general public, $5 for Wesleyan faculty/ staff, and free for Wesleyan students. One hour listening session, with bagels and coffee available. 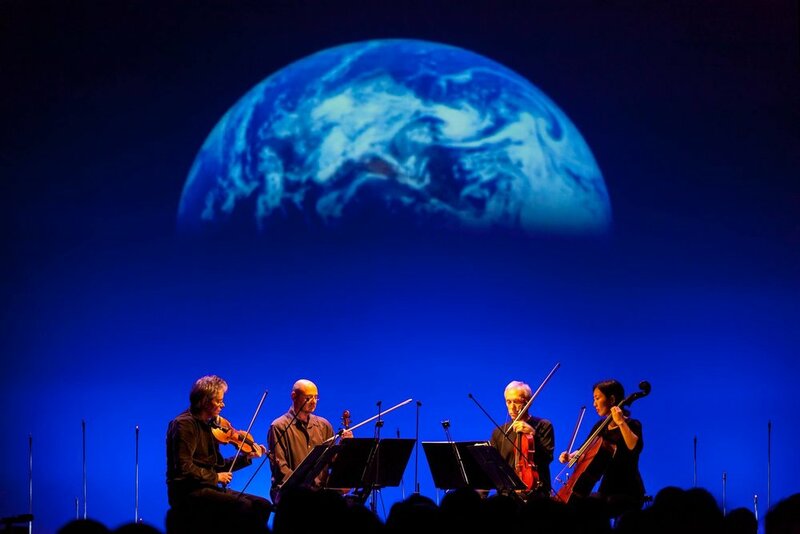 Kronos Quartet is playing a concert at the Crowell Concert Hall (located at Wesleyan University's Center for the Arts) at 7pm on Sunday, April 15th.